Using essential oils for Virgo earth sign is a great way to calm Virgo anxiety, help deal with Virgo insomnia and soothe Virgo stomach problems which a lot of Virgos suffer from. So, what are the challenges that Virgo go through in their everyday lives and how can essential oils help? Let’s look at the characteristics of the Virgo man and find which essential oils are suitable for Virgo emotions and physical well being. I have always been of the opinion that if you want to really understand a male Virgo, the best source of reliable information is their mother. Most Virgos have a special relationship with their mother which becomes stronger as the years pass by. Family heirlooms or special family gifts can often be found in a Virgo's drawer where they are kept as valuable treasures. Virgo's love scents that remind them of their mother or other special persons of their childhood. If, for example, their mother was using rose essential oil, Virgos would most probably feel very connected to the aroma of rose, which can be very useful to ease Virgo anxiety. Virgo male may often be seen as a man of habit. Their wardrobe may be full of clothes, but they will always find themselves drawn to one specific pair of trousers because of its perfect fit or a specific detail they simply find hard to resist. Or no matter how many fancy restaurants they have been to, they will always want to go back to that small Greek Taverna where the waiter is super fun and the atmosphere feels like home. A perfect example of the Virgo as a man of habit is the billionaire Warren Buffett, a man who has lived in the same house for his whole life. Male Virgos like stable long term relationships. Due to their analytical and observant mind, they highly appreciate a clever intuitive mind that will understand their deeper needs and emotions without them needing to explain anything. Also, since they themselves are sometimes over-analytical, they like to be around people that can think practically, logically and quick without the torture of the over-analysis that Virgos often go through themselves. This can also ease the anxiety they may have due to the overload of home or work responsibilities. So, people that help them clear their mind when they need to take decisions, practically help them with the overload of everyday life chores or calm them during a stressful period of their lives are excellent for Virgos to have around as friends, colleagues or partners in life. Virgos may often be interpreted as somewhat mysterious. The truth is that they don’t like talking about themselves. They rather prefer others do the job of analysis. Not only do they want to be understood without providing any help, but if others cannot understand them as much as virgos want them to, they can become agitated, upset, unhappy or depressed. They may start complaining if they don’t get what they want like spoilt children or become reclusive and antisocial till they find their balance. Do you sometimes wonder what a Virgo is really attracted to? I think it is the little details in life, an attractive smile, a special touch, a couple of encouraging words at a time they really need it or even a perfectly organized dinner that will be super pampering to their senses. Virgos love details, they live for details, so if you are not a person that can appreciates or see all those special details in life, you had better not get close to a Virgo! Sometimes overly obsessive with cleanliness, Virgos always appreciate a clean house and working space. Of course,they are very meticulous when it comes to their personal hygiene, too. Often, Virgos have a good sense of humor. Some very famous comedians are Virgos. But remember, no matter how humorous a Virgo can be, he may not always be able to see the funny side of life and start over complaining or complaining over small things. That is an indication that the Virgo is feeling anxious. In this case, essential oils can help a Virgo feel more calm and grounded. Virgos love to charm and be charmed. They have a natural instinct to detect charm in people and they love being around people they find charming. They find it exhilarating and mind stimulating. On the negative side, Virgos can become very superficial, lacking desire to be empathetic about people's deeper feelings. As an Astro sign that is ruled by the planet of Mercury, they can use their ability of shrewd speakers to convince and sometimes manipulate people according to their interests and desires. Here are the best oils you can use for some of the emotional and physical well-being challenges Virgos face in life. With an overactive, over-analytical mind that is driven from an urge to perfection, Virgos often times overload themselves with work, and their high standards may often lead them to stress and anxiety. Their workaholic heart can often lead to workaholic addiction, burn-out, mental and physical fatigue, insomnia and depression. With its sweet floral and citrusy aroma, neroli oil (Citrus aurantium) is energizing but wonderfully calming at the same time. Neroli has been traditionally used for anxiety and depression. It has sedative and antispasmodic properties, so when it is topically used, it can also relieve nervous tension. For Virgos that develop stomach problems due to dyspepsia, neroli is a great oil to use because of its historic use for nervous dyspepsia. Distilled from the roots of the vetiver plant, Vetiver oil (Vetivera zizanoides) is well known for its grounding calming properties that are very beneficial for the anxiety and stress of the ‘monkey’ mind, a term used for minds that are overactive, restless and stressed. Vetiver has been historically used for anxiety, depression, hyperactivity, insomnia,and headaches related to tension. It is emotionally relaxing and a favorite oil of people trying to feel more balanced and calm. Frankincense (Boswellia carterii) is my favorite go-to oil for those times that I need to breathe a deeply calming essential oil to ease my stress and anxiety. It is also good for opening airways and breathing, so rubbing it on your chest or upper back when you have a cold can provide you with some additional benefits. Here are the 2 oils that can help Virgo fall asleep more easily and enjoy a more restful sleep. Many studies have demonstrated the anxiolytic and sleep-inducing properties of lavender oil (Lavandula angustifolia). It is one of the top oils used for insomnia. You just need to use a couple of drops, because in large doses, lavender can become a stimulant. Chamomile Roman oil (Anthemis nobilis) is a wonderfully relaxing oil that is widely used in essential oil blends for good sleep. It has been historically used for digestive problems, so for Virgos who suffer from digestive as well as sleeping problems, chamomile Roman is a great oil to use. It is also gentle enough for children’s use. I love diffusing it with other essential oils and make a blend for topical use on the chest and upper back which puts my hubby to sleep literally in seconds! There may be a lot of factors causing stomach problems to Virgos including stress and an unhealthy diet. For digestive problems, there are some essential oils that have been traditionally used to improve digestion and relieve digestive problems. Peppermint (Mentha piperita) is well known for its cooling and refreshing to the head properties. It has been historically used for digestive problems such as heartburn and indigestion, so it can be very useful for Virgos suffering from stomach problems. Just beware! Do not use it before going to bed because it has stimulating properties. Apart from its ability to improve concentration and memory, rosemary oil (Rosmarinus officinalis) is popular for helping deal with indigestion and bloating. It is also good for stimulating the appetite. Rosemary oil is said to help with constipation and improve circulation. Giving yourself a tummy massage when you are suffering from indigestion can help relieve those unpleasant symptoms. Virgos, like every astro element, have their own challenges to deal with. 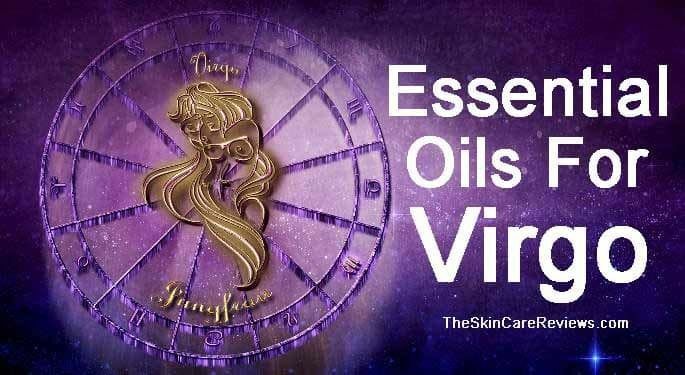 Essential oils for Virgo earth sign can provide Virgos with a useful tool to have more control over their emotions and improve both their physical and emotional well being.